I learned about Scottish Oatcakes (Scottish Bannocks) from Outlander…they’re great topped with butter, jam, and can also have a sourdough version. In my last post I told you about science and magic and my approach to baking. 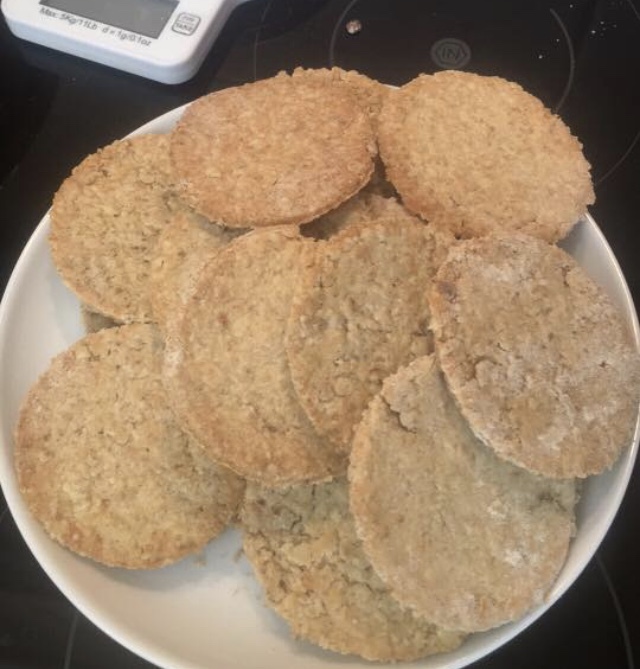 Now it’s time to get to the meat of the “& Scones” half of this blog (no pun intended)…we’re going to talk about Scottish Oatcakes, aka Scottish Bannocks. What is a bannock? Well, that really depends upon where you are in the world. The bannock I grew up with here on the Canadian west coast came from the diets of our First Nations; an unleavened dough of wheat flour, water and salt, molded over a stick and toasted over an open fire. In other regions of North America, you may know bannocks as something slightly different. There may be cornmeal and baking powder in the dough, and they could be deep fried, rolled in sand and cooked in a pit, or baked in the oven. Traditional ingredients prior to Europeans included corn and nut flours, those ground from plant bulbs and tubers, as well as seasonal fruits and seeds. 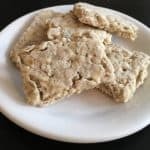 In Scotland, where the term originates from the Gaelic bannach, meaning cake, bannocks were originally round, medium-sized flat breads made from a wet dough of barleymeal and/or oatmeal. (Meal is an unsifted powder, coarser than flour, ground from any grain.) They were cooked on a girdle, or griddle, and were cut into scones, or wedges. In Scotland today, the term refers to any baked item similar in shape and size to the original bannock, and is also used to describe a large circular scone that has been scored into sections. Wheat flour and baking soda are included in most modern recipes. Confused? I’ve been researching these for days, and I’m still a little unclear. The most important thing to remember is that a bannock is many things to many people. It’s interesting to me how many cultures have the same type of bread, just different based on the grains used at hand (remember how I said patterns emerge? See??). I grew up eating pita and tortillas; later I discovered naan, roti, lavash and the like; and my girls baked Indian Fry bread at school. These are all examples of regional native flat breads that developed separately but with a common purpose. I love how the Europeans use weight measurements instead of pesky volume measurements…no need to convert anything (well, except for temperatures because I’m still an American and we use Fahrenheit instead of Celsius in our ovens). So could I leave well enough alone? Well, you don’t know me that well yet, so I’ll forgive you for not immediately answering in a loud, confident voice, “NO!” I started playing. First, I tried the recipe using whole wheat flour (you know, to up the fiber a bit). The dough ended up needing about 1/4 cup more water, but otherwise it was fine. Another thing you don’t yet know about me is that I bake sourdough bread using a natural starter (i.e. naturally leavened without commercial yeast…that’s another example of how I replace the commercial stuff with homemade stuff when I can). I might talk about my adventures in sourdough baking at a future time, but suffice it to say that every week I’ve got about a cup of sourdough starter discard that I need to use (I won’t…I can’t…just throw it away). 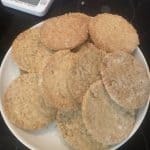 I’m always looking for ways to use that unfed sourdough starter discard, and bannocks seemed like a good place to try. Can I still call them Scottish bannocks if I make them with unfed sourdough starter? I want to be culturally sensitive here. Hopefully some nice Scot will write to me and tell me it’s ok and not to overthink things too much (and maybe send me a picture of a puppy…I love puppies). Another comment…there was a lot of discussion on that particular Facebook thread about how thick to roll out the bannocks. Some people said they should be thin and crispy, others thicker and chewier. I settled on rolling out the dough to about 1/4″, mainly because I’m not that great at rolling out dough. Also, I don’t like rolling and re-rolling dough to cut out rounds, so instead I roll the dough out to an 8” x 10” rectangle, cut into 16 pieces (or an 8” x 9” rectangle, cut into 12 pieces). It’s easier for me and there’s no waste. A third comment (yeesh! 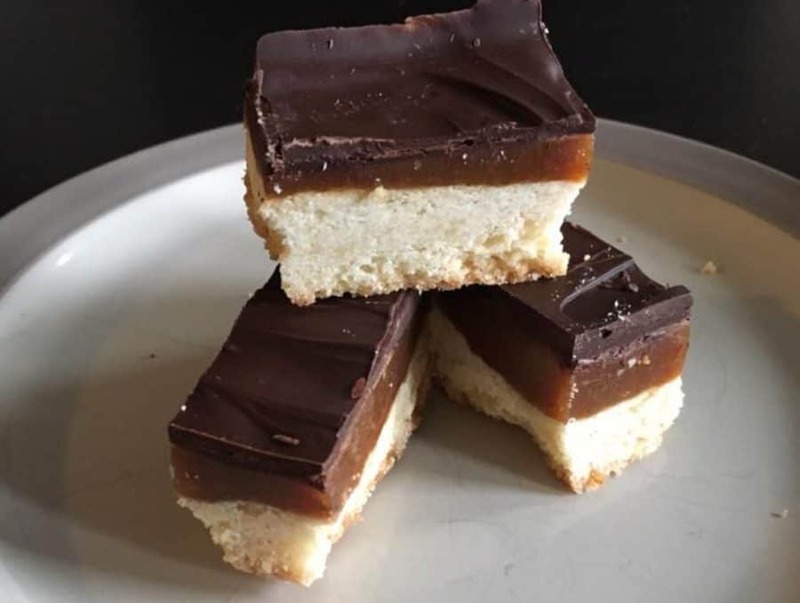 ), updated in Jan 2019…speaking of Outlander and how to make bannocks, I wrote a blog post for Outlander Cast about using an 18th century vs. modern bannock recipe, and suffice to say I learned a thing…or two…or three (especially about the language barriers between the US & UK). It’s worth a quick read (and a laugh). Hint: oats in the US & UK are not the same thing. Both versions of the bannocks are wonderful. They’re great topped with butter, jam, or both because they can go sweet or savory. I tend to eat them for breakfast with eggs, but they’re also nice for an afternoon snack. I usually keep a few on the counter in a sealed container and freeze the rest…they defrost and reheat well. I hope you’ll try these and if you do, please send me a comment and a picture! Even if you don’t bake up a batch, comment anyway! I’d love to hear about other versions of this versatile treat. I find your blog delightfully entertaining and informative. ….and thankfully grammatically correct and without misspellings. Thank you so much! Can’t tell you how distracting it is to try to read blogs littered with errors of all sorts. Keep up the excellent work! Thanks, Sarah! I’m glad you’re joining me on the journey.